Michele Cox is the Director of P2P Dance Center and its performing troupe, Atlantic Ballet Co. Ms Cox instructs Classical Ballet levels I - IV, Junior Ballet, Jr. Jazzin' and Kinderdance in six midcoast locations. Although P2P Dance Center, on 27 Knowlton Street in Camden, houses many of the school's classes, Ms. Cox has extended her instruction to five outreach facilities: Belfast Dance Studio, Waldo County YMCA, Edna Drinkwater School in Northport, Miller School in Waldoboro and the American Legion Hall in Damariscotta. A co-founding member of P2P Dance and its performing arm, Atlantic Ballet Company, Ms. Cox studied classical ballet, modern, jazz and African dance with such renown artists as Sara Yarborough, a soloist with the Alvin Ailey Company, Andrei Bossov, soloist with the Kirov Ballet and Marinsky Theater, Sharon Dante, director of Nutmeg Conservatory of the Arts, Arthur Hall of Philadelphia and Robert Steele, soloist with Boston Ballet and the Royal Danish Ballet. After performing many dance roles choreographed by these artists, she furthered her dance and teacher training at Bates College, Duke University, Manhattanville College and Portland Ballet. Ms Cox is a lead choreogrqpher and performer in P2P Dance Center's annual spring and summer performances, as well as in Atlantic Ballet Company's popular "Nutcracker" Ballet, a highlight of Midcoast Maine's “Christmas by the Sea” holiday celebration week. 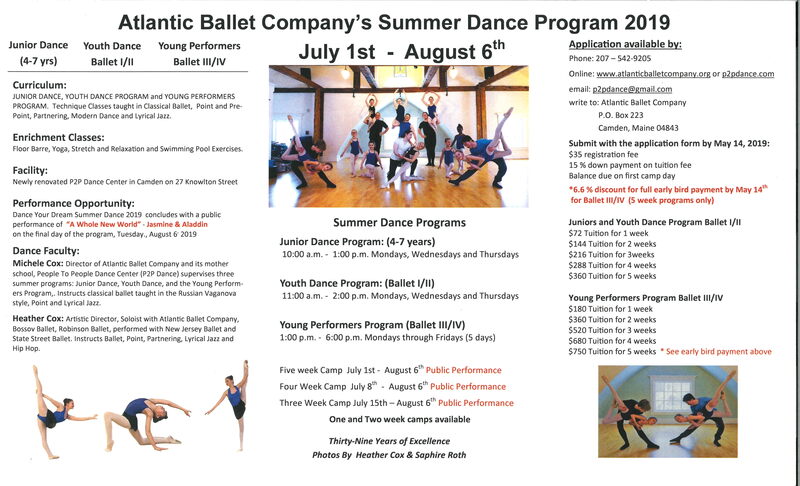 Heather Cox is the artistic director of Atlantic Ballet Company and its training school, P2P Dance Center. Having begun her formal training at the age of seven at P2P Dance Center, Ms. Cox furthered her studies in the four year pre - professional training program at Nutmeg Conservatory of the Arts in Torrington, Connecticut. She studied with such artists as Eleanor D'Antuono ( Joffrey and ABT), Sharon Dante, Alexei Tchernichov, and later with Andrei Bossov, soloist with the Kirov Ballet and Marinsky Theatre, Gayla Zukevich, director of Ballet Michigan, and Robert Steele, soloist with Boston Balet and the Royal Danish Ballet. Ms. Cox has performed professionally with ballet companies throughout New England and California, such as New Simsbury Light Opera, Centennial Theater, State Street Ballet Company, Robinson Ballet Company, Bossov Ballet Theatre, Nutmeg Ballet and Atlantic Ballet Company. Her recent roles as principal dancer include Cinderella, Sugar Plum Fairy, Dew Drop Fairy, Snow Queen, Giselle, Christmas Angel, Paper Ballerina, Queen Ravenna and Jasmine. 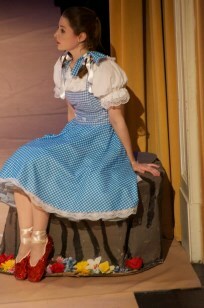 She has also performed lead roles in Raymonda, Firebird, Carmen, Marzipan, Voices of Spring, Holly and Ivy and Storybook Princesses. Copyright © 2019 P2P Dance Company. All rights reserved.